There are plenty of times when I start fishing for the day that I don’t have a clue, I suppose that many clients think that if I am the guide I may have some inside track on events but that is simply not the case. Generally I am at pains to explain that, I start off every trip in experimental mood, trying to figure out what is going on today.. I recall some sage advice from years back that said something to the effect that any angler who ties on a fly in the car park is overly confident and highly likely to receive some karmic backlash. 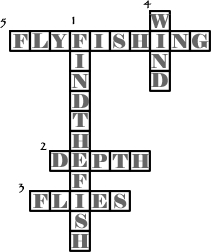 No fly fishing is a puzzle and a little like the crosswords in the paper, every day the situation is reset and you start again with a blank page. 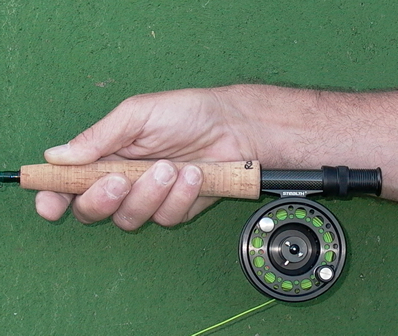 Flyfishing is really a puzzle, but one that you can sometimes solve if you stick at it. However we generally do have a plan and when Mike Spinola and myself arrived at Lakensvlei recently we stuck to our normal game plan. “First find the fish, then find the depth and then find the fly”. Now we are both or at least have both been competitive anglers and we still work at the problem much as we might in the heat of battle, albeit a tad more relaxed. 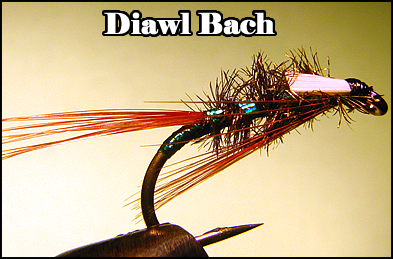 This holographic green version of the Diawl Bach worked wonders once we found the fish. The general process involves making at least one long drift in the boat to start with, both to settle down and to try to locate some fish. Location of fish is in itself something that is defined by one’s attitude, a hook up proves very little. 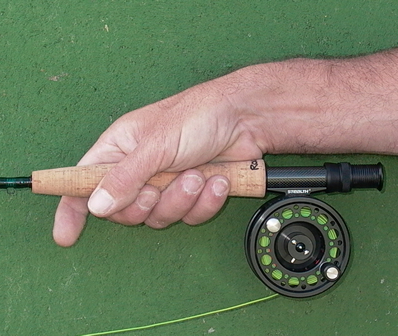 Two hook ups in close succession, both anglers hitting fish at the same time or two fish on the line at once and you have found them, the random attentions of a single fish, what the UK anglers refer to as “A Oncer”, really doesn’t do a whole lot for you. So off we set, drogue out and aiming for a long drift down the lake, covering different depths and figuring that we should find fish somewhere if we persevere. I did pick up a small fish within the first twenty minutes but it didn’t prove much and we didn’t find more for quite some time. Then another individual followed by a lot of absolutely nothing. Then another again a oncer and as we drifted onto the lee shore with the waves lapping against the bank Mike picked up a lovely brownie. Again though that proved little and brown trout in particular tend to prefer a solitary existence, finding a brownie doesn’t help much in the grand scheme of things, no matter the pleasure of having the line pull tight after hours of labour. Eventually we jumped out of the boat for a stretch and a quick call of nature and I realized that the water was dreadfully warm up against the bank. That had me thinking and I was becoming convinced that we should be seeking out the cooler upwellings from the depths along the windward shore. Mike took a bit of persuading, we generally do well on the lee shore, the waves wash out food forms from the mud and terrestrials get piled up by the wind but I was beginning to doubt the tactic. We fished a few more short drifts where we had picked up the odd fish to no avail and eventually headed back on a long row into the wind in search of the windward shore. Starting right against the bank one could sense that the water was already cooler. What tends to happen is that the warm water rises to the surface and as a result is blown away from the windward shore piling up on the leeward one. To fill the void an upwelling of colder water from below the thermocline brings temperatures down and cooler water nearer to the surface on the windward bank. Anyway that first drift produced two fish for Mike on and olive Zonker strip dragon and one for me on an olive and red booby pattern. We repeated the drift and hooked up both at the same time, repeated again and we both had fish within two casts of the first. This was the concentration we had been looking for. The fish weren’t that deep down perhaps three feet or so and as the day progressed they seemed to come up higher to the point that I saw one of the takes on the surface as the flies landed. 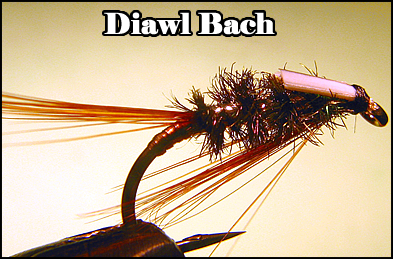 Diawl Bach with biot wing buds and holographic red tinsel rib and tag. Notably we both commented that these fish were fighting much harder than those we had caught in the morning and more subjective evidence that the water was cooler nearer to the surface here than further downwind. Having had only five fish between us for the morning we ended the day with 28 in total. Even more encouraging was the fact that we never repeated that drift without at least one fish in the boat from the very first drift until we were pushed off the water by fading light. Sometimes a plan doesn’t work out, you have to always work to a theory even if it turns out to be incorrect but this time I think we both walked off the water pleased that despite the problems we eventually figured things out and received our just rewards as a result. For the record the fly patterns weren’t that critical although the fish seemed to be focused on more natural bugs, olives and browns outperformed bright colours, in fact we never got a fish on a brightly coloured fly for the whole day. One of the more interesting things was the number of fish I got on the Diawl Bach on my middle dropper, a small midge like pattern in size 10 which pulled something like a third of the fish I caught in the colder water. In general I find that the point and top droppers out perform the middle by a good margin and I figure that there had to be something to that pattern. More than likely its resemblance to hatching midge pupae. 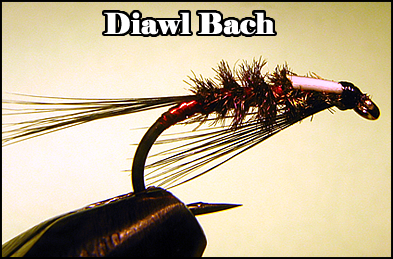 The Diawl Bach has been copied and modified by almost every stillwater angler that ever lived, I have seen more than one article on nothing else but variations of this fly so I am not going to suggest that my own fiddlings are anything special but I have a few variations up my sleeve and you may wish to try a few of them. Certainly not a single English stillwater boat angler would consider going afloat without a few “Little Devils” (that is what the Welsh term actually means) and many anglers carry dozens of patterns of the same genre. Once again however we proved our point, it is rarely the fly that is the most important thing and the process of finding the fish first, then honing in on the depth and finally sorting out the flies worked really well, even if it did take us some time to get the answer to the puzzle. Variations of the Diawl Bach abound, I like these with the biot wing buds, they are very “midge like” and the white offers something of a subtle “hot spot”. I am not sure if one really needs to be carting a thermometer around, we seem to have enough stuff in the boat already to my way of thinking. However this lesson may well be one that earns you a fish or two on your own waters in warm weather so something to bear in mind. Happy fishing and remember, you got to find the fish first before you can catch them. 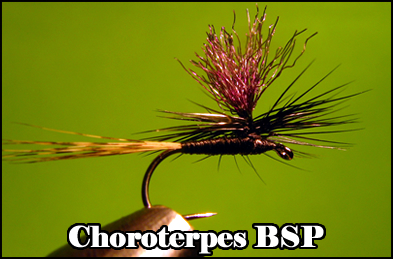 The simple BSP (Bog Standard Parachute) can be adapted in numerous ways to fullfill a wide variety of needs, covering a plethora of upwinged insects in a variety of sizes as well as many midges. Recently I had some clients with me on the river who were rushing off home to catch a spot of the rugby, which left me with something of a dilemma, should I return home as well or maybe catch a couple of hours of fishing and miss the Super 15? In the end with a bit of careful planning I managed to get in some much needed personal angling time and still make it to the pub closest to the river to catch the kick off. Of course that had the minor disadvantage of having to limit my alcohol consumption during the game and to stick to light lager during a thrilling match when normally I might have partied a little harder with the Stormers win but you can’t have everything.. Anyway, the morning was tough, low water and few fish on the move, those that were were exceptionally spooky and we did all the normal stuff like remove watches and fish thin tippet and all of those little adjustments that one can make when the going is tricky. All to pretty much no avail, sure the clients raised a fish or two but they were missed, striking being the one part of fly fishing that one can’t practice. So then early afternoon saw me on the stream in very tough conditions and with an hour or two to myself. I don’t fish when I guide and hadn’t had anything like enough angling time of late, well out of practice for sure so I was looking forward to a bit of time casting for my own account as it were. The fish came on a little here and there, there were a few rises and in the occasional pool numbers of fish rose energetically to Choroterpes spinners egg laying over the water. The conditions were perfect with a light upstream breeze and I fished a very long twenty odd foot leader down to 7X and a size 18 dark BSP (Bog Standard Parachute) pattern. That worked pretty well although when the breeze failed to ruffle the surface of those pools the takes dried up. I had met up with Riaan at the top of my beat and the beginning of his, apparently he had set off late and was fishing very slowly and we discussed tactics. He like me was fishing a dark fly on a long fine leader and suggested that he thought that the fish were getting wary of the white wings on the paracute posts of the BSP style flies. I have certainly had this with bright posts designed to make spotting the pattern simpler and no doubt over time the fish may well shy away from the white as well. In fact I had already moved over to gray posts on a number of my patterns. In the end I finished with eleven fish in the net and perhaps half a dozen missed due to mistimed strikes or even the fish coming short (could be those posts again, putting them off at the last moment). 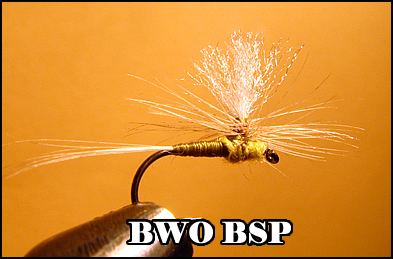 However with the BSP style of tying variations are very simple to achieve and I have found that by tying in the posts in two parts one can gain beautiful bi-colour wings that are more in harmony with the naturals without having to give up entirely on visibility. 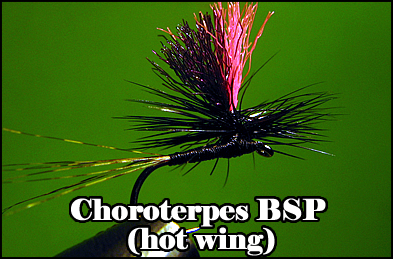 Common combinations are a small hot wing in front of a more toned down main wing. Bi-visible wings of black and white which aid visibility in bright reflective light and evenings and pure black wings which show exceptionally well in the silver shimmer of the late afternoons. BSPs enjoy a number of features which I think can be advantageous compared to more standard commercial ties. The whip finish is unobtrusive and done with a super glue whip around the base of the post, this adds to both the durability of the fly and means that there is no whipping about the eye of the fly which frequently leads to difficulty in threading the tippet. Whipping around the base of the post reduces bulk, keeps the eye clear of thread and improves durability. The thread only body on most of the patterns provides for super slim profile, particularly useful on tiny dries. 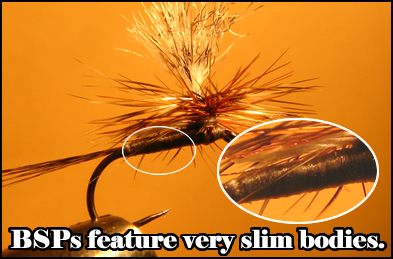 Slim abdomens are features of the BSP design, although of course you can fatten them up if you wish to. I thought that I would share a few variations of tying the BSP’s, sure the standard is a thread body and a white or gray wing of poly-yarn combined with suitable hackle colours. Other variations can be easily achieved though. 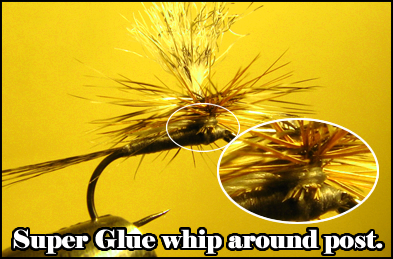 Quill bodies can be used with ease although on these patterns I add a small amount of dubbing at the thorax to cover the butts of the quill. Thorax colours can be changed with a pinch of dubbing, bi-visible wings can be simply manufactured from different colours of post material, usually poly yarn and you can even dub the abdomen if you feel so moved. Plus use of two hackles allows subtle variations of colour as with the Adams BSP shown so really one can cover pretty much any upwinged fly and a number of midges as well with these simple variations. The real joy to me of this style is that they are not only pretty simple, even the more complicated ones, but they remain slim and sparse, far more so than commercial patterns and from my perspective that makes them real winners when the fish have seen it all before. 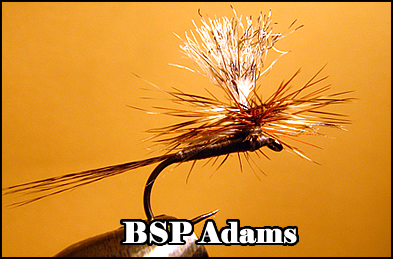 Adams BSP, featuring banded wing post and two hackles of ginger and grizzle. 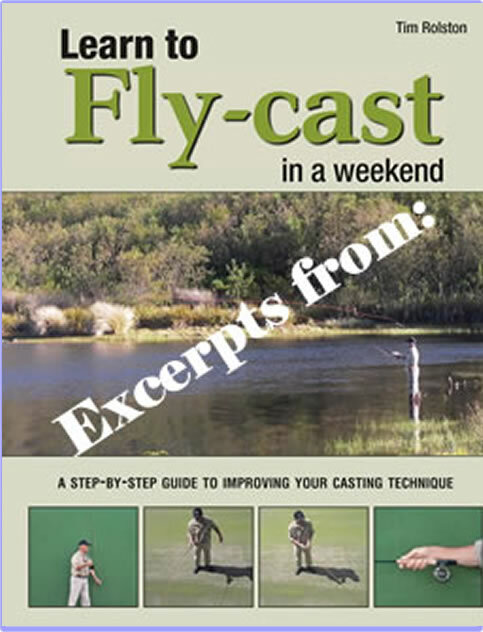 A simple and still slim version of the classic mayfly pattern. 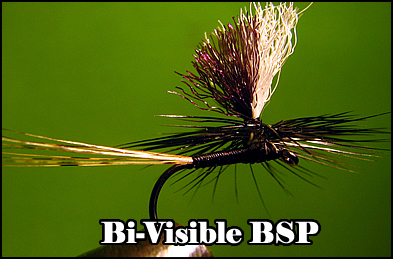 Bi-visible wings, the latest variation providing subtle colouration and still better visibility. Blue Winged Olive BSP with dubbed thorax. Choroterpes BSP, A good imitation but tricky to see under some light conditions. 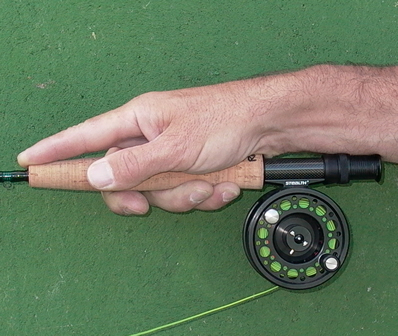 The Bi-Colour "hot wing" makes for better visibility without spooking too many fish. 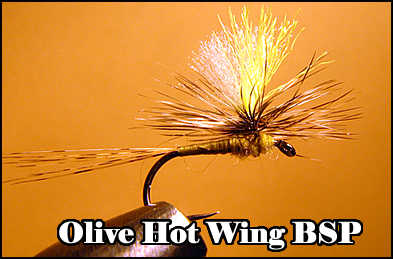 Olive variation with fluoro' yellow bi-visible hot wing. Disclaimer: From time to time advertising appears together with these posts. Although they may prove pertinent and could be useful to you the participants and writers of this blog have no control over their appearance nor receive any financial rewards from them. Adverts other that promotions within the post therefore do not imply any recommendation or endorsement from anyone associated with the Fishing Gene Blog.